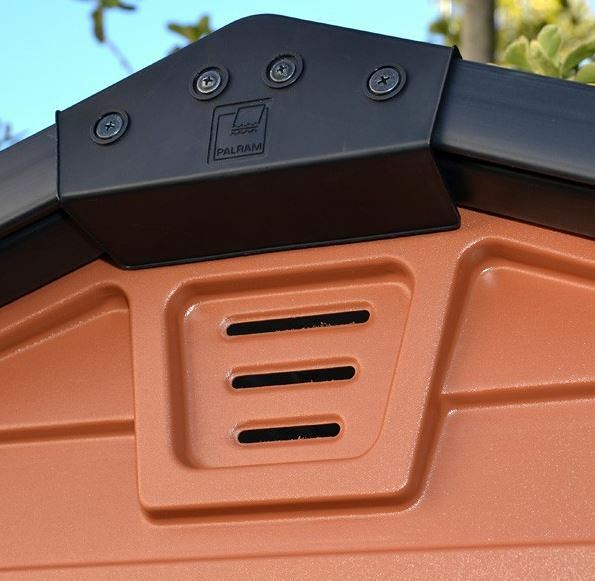 The 6 x 8 Palram Skylight Plastic Amber Shed is a garden shed that combines the practicality of a plastic shed with a traditional appearance. The unique feature of this shed is the skylight roof, clear on the inside to let in the light but opaque on the outside for security. 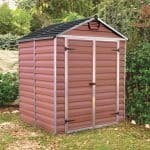 This 6 x 8 plastic shed has plenty of features that make it a worthwhile addition to any garden. One of the biggest aspects is the skylight, which is made out of polycarbonate. This material is completely resistant to UV rays. UV rays can actually damage the building, bringing cracking and flaking. The skylight protects the building and the contents from these harmful effects. You also gain access ramp for the building, making access for wheelbarrows very easy. The double doors are wide and made out of aluminium. Front and back vents come as standard, and increase the perfect temperature aspect of the building itself. 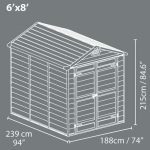 Store all of your outdoor and garden equipment in this medium-sized shed. Adding freestanding storage will increase the space further and keep smaller items neat, organised and easy to locate. With lockable latches on the double doors, you will have the peace of mind knowing that your items are kept secure whilst not in use. The Skylight shed is a great example of how plastic sheds can provide unique and useful features such as the skylight roof displayed in this model. 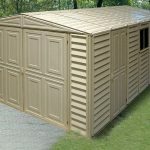 In this section we discuss other features that this Palram shed has to offer and how they can fit your requirements and lifestyle. Exterior: Built from polycarbonate panels on a galvanised steel frame, the amber shed is built to last and showcases all the advantages of a plastic shed. 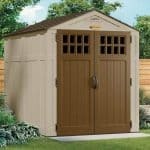 Maintenance free, the exterior will not peel, rust or rot and is completely weatherproof. The skylight roof is the main feature of the shed and provides a bright interior, with a clear roof seen internally, with an opaque roof visible from the outside. Interior: At 6x8ft, the shed interior is medium-sized and a large enough space to store the usual garden equipment; a barbeque, a lawnmower, tools, bikes, etc. Freestanding shelving may be added to create an organised and clutter free space, particularly for smaller pieces of equipment. With front and back air vents, air will be able to circulate and contents will be kept free from damp, mould or rust. An easy access ramp for wheeled items such as wheelbarrows and lawnmowers makes accessibility a breeze. 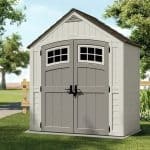 Double doors: Although this Palram shed has double door functionality, in reality the doors combined are probably only slightly bigger than a single door. The sheds narrow doorway also means that accessibility is limited slightly, particularly for larger items. Security: The sheds double doors have lockable latches, onto which a padlock may be fitted in order to keep your sheds contents secure at all times. A padlock may be purchased separately for a modest price. 6 x 8 Palram Skylight Plastic Amber Shed: How easy to build? 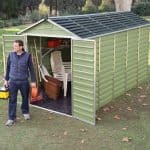 The plastic amber shed can be built within a day for those with a basic knowledge and experience of DIY. Following the step-by-step instructions assembly is straight-forward, guided along by easy-to-follow diagrams and written content in several languages for accessibility. The package that you will receive will contain all of the plastic panels, fixtures and fittings required for easy assembly. It is recommended that two people assemble the skylight shed, both for safety reasons and efficiency. A set of basic tools will be required for assembly. 6 x 8 Palram Skylight Plastic Amber Shed: What is the overall quality like? The Palram skylight shed is a fantastic storage solution that combines practicality and durability with innovative design to be everything you need in a storage shed. 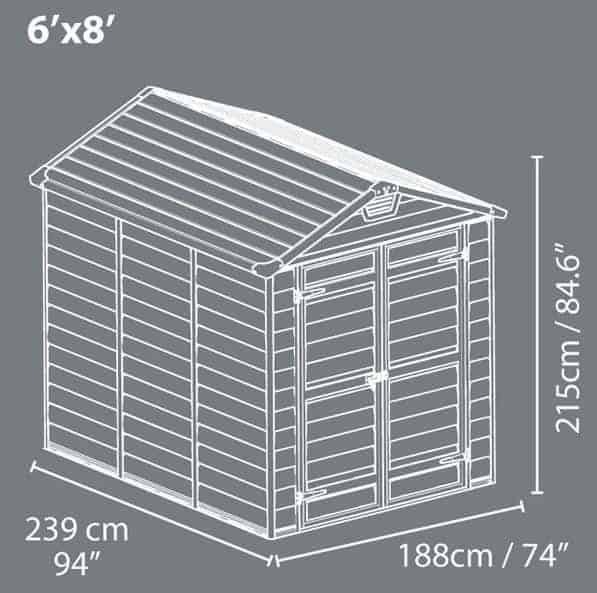 Strong polycarbonate panels on an aluminium galvanised steel frame, makes the shed solid and built to last. 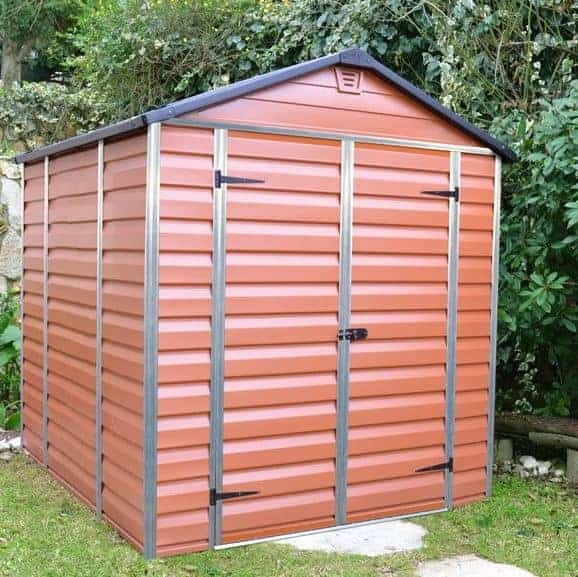 The plastic nature of the shed means that it is completely maintenance free and UV resistant, meaning that the colouring will not fade or peel over its lifetime. The product comes with a 10-year anti-rust guarantee from the manufacturer for your peace of mind. Front and back air vents allow for constant air circulation throughout the interior, preventing damp, mould and rot. 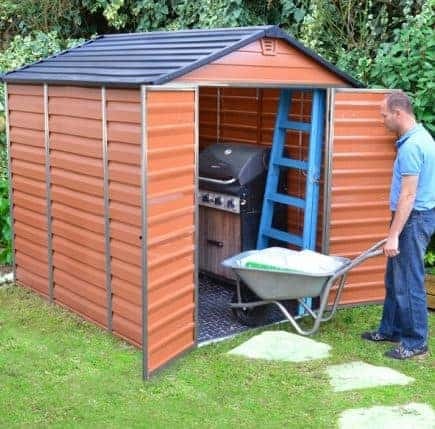 The shed exterior is washable, so if you wish to clean the shed after the winter months then the shed will kept looking smart. 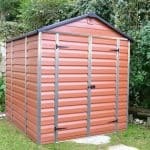 The 6 x 8 Palram Skylight Plastic Amber Shed is an excellent medium-sized shed for storing outdoor and garden equipment. The skylight roof feature gives the shed a bright and airy feel whilst keeping visibility low for security purposes. 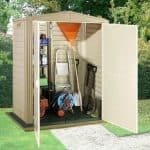 Completely maintenance free, the shed is both durable and weatherproof, providing a reliable storage solution for many years to come. At this low mid-range price you simply can’t go wrong with this model!